Gold and silver are having one of their best days in quite some time, while the mining indices GDX and GDXJ are underperforming. 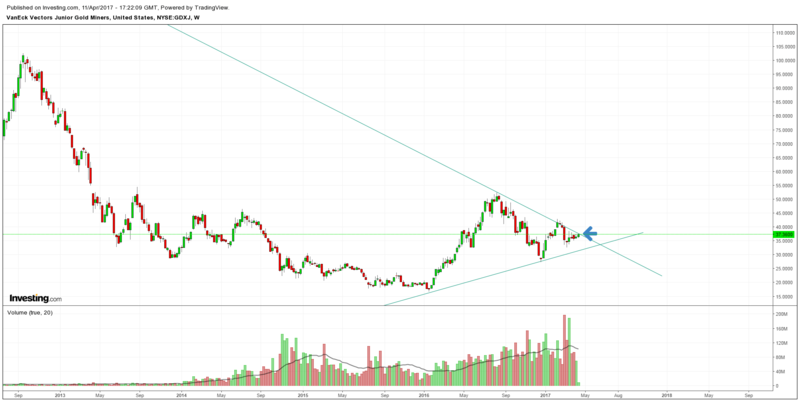 I believe the chart above for GDXJ holds the key in terms of where the precious metal mining space is headed in the coming weeks. This multiple year down sloping trend line has proven to be a hard nut to crack for the junior miners. Attempts have been made several times since 2016, but has proved unbreakable as of yet. IF we break this ceiling in the next couple of days on a closing basis, I think we are in for a big leg up. If not, I think we well head lower for a few weeks. I don’t expect a crash, but maybe we could see a touch of the bottom wedge trend line, before heading higher for another (hopefully final) attempt.